Eliza Jumel (née Bowen; April 2, 1775 – July 16, 1865), also known as Eliza Burr, was a wealthy American socialite. Born into poverty, through her own ingenuity and an advantageous marriage to a wealthy merchant, she was by the time of her death one of the richest women in New York. Eliza Jumel was born Elizabeth Bowen in Providence, Rhode Island on April 2, 1775 (she would later joke "that she had come near being an April fool"). She had two older siblings, John (born 1769) and Mary, called Polly (born 1772). Eliza's mother, Phebe Kelley Bowen, worked from a young age as an indentured servant. Her father, John Bowen, was a sailor. Eliza's father died in 1786, when she was eleven. Her mother remarried in 1790, to an itinerant cobbler named Jonathan Clark, and together they moved from town to town throughout New England, and then finally to Williamston, North Carolina. There they both succumbed to yellow fever in 1798, victims of an epidemic that may have also taken the life of Betsy's older brother. After her parents' deaths, the ambitious young Eliza moved to New York, changing her name to Eliza Brown. There she became an extra in the local theater, and during her early years in the city she may have also found work as a domestic servant. Eliza's sister later joined Eliza in New York, changing her name to Maria Bowne and in 1805 marrying William Jones, three years later giving birth to a daughter she named Eliza Jumel Jones in honor of her sister. Possibly through her performing career, or the close proximity of their addresses in New York, Eliza met and later married the wealthy French-Haitian merchant Stephen Jumel in 1804. Stephen and Eliza may have found a common bond in their humble origins and ambitious nature: born Êtienne Jumel in France in 1765, Eliza's future husband grew up in a merchant family, emigrating to the American Colonies on the eve of the French Revolution and, like Eliza, changing his name to better fit his new life. The newly-rechristened Stephen Jumel married Eliza Brown on April 9, 1804. A rumor circulated that Eliza had been Stephen's mistress, and he had only married her on her deathbed when she became convinced that "'she c[oul]d not die in peace until she was lawfully married." Though certainly false, its existence and persistence both highlight the unconventional nature of the marriage and Eliza's unstable place in New York's merchant class. Due to both her humble background and career on the stage, Eliza was seen as a suspicious figure at a prosperous merchant's side. In 1807 Eliza became an Episcopalian, her baptism taking place at Trinity Church in Manhattan. This was notable both because her chosen religion was not that of her husband (Stephen was a lifelong Catholic), and because it was the religion of America's political class at the time. Though she and her husband had no children of their own, they took in Mary Jones, the eldest and illegitimate daughter of her sister Polly (now called Maria), who was thus rechristened "Miss Jumel" and lived with the couple as their daughter. In 1810, Stephen and Eliza moved to what became known as the Morris-Jumel Mansion in northern Manhattan, turning the historic home into their summer villa. Built in 1765 by Colonel Roger Morris for himself and his wife Mary Philipse the daughter of Frederick Philipse, the house then became George Washington's headquarters for several months in 1776 after the Morrises, who were Tory sympathizers, had fled back to England. Though it was from these headquarters that General Washington won his first victory of the war, the Battle of Harlem Heights, he and his troops soon moved on and the mansion was take over by Hessian soldiers, then confiscated after the war came to and end. In 1815, Eliza and Stephen traveled to Paris, where they were linked to Bonapartist sympathizers. Eliza owned several relics from Josephine Bonaparte's extended family and claimed a close relationship with Bonaparte. It is now believed, however, that Stephen and Eliza had only a distant acquaintance with the Bonapartes, and that they bought most of the Napoleonic items at auction in Paris. Eliza had taken lessons with a French tutor during her courtship with Stephen, and she and Stephen easily conversed in both French and English (though Eliza never became totally fluent). Despite later accounts of an acrimonious marriage, their personal letters show them to have been an affectionate couple throughout their union, although letters on both sides were occasionally marked by fears of abandonment. Either illness or controversial political opinions lead to Eliza leaving France in 1816. Eliza returned to her home in New York, while Stephen Jumel remained in France. Stephen saw his fortunes decline during a series of economic depressions, leading to the collapse of his merchant trade in Paris. Eliza, however, managed their American estate and holdings with a good business acumen, and proved an astute investor. She made herself unpopular as a businesswoman in New York, however. Several of Stephen's business acquaintances were dishonest with his finances during the Jumel's absence, and it became Eliza's task to both make accusations and recoup money lost. Through her initiative, the couples' finances were saved from ruin. The couple continued to travel between New York, Paris, and Stephen's family home in Bordeaux. During these travels, Eliza amassed a large and respected art collection, often considered the first great collection of European Art in North America. Stephen Jumel died in 1832 of pneumonia at the age of 67. Fourteen months after Stephen's death, the fifty-eight-year-old Eliza Jumel married the controversial former United States Vice President Aaron Burr. She may have married Burr to increase her stature; while Burr may have wanted access to her fortune. Burr mismanaged the liquid assets remaining in the Jumel fortune, and the two separated only four months after their marriage. Eliza's prudence in real estate management, however, allowed her to remain financially solvent. The two divorced, which was finalized on September 14, 1836, the date of Burr's death. Eliza Jumel continued to travel throughout Europe and to the summer retreats of New York for twenty years. In 1842, an encounter with Anne Northup, a famous chef and wife of the kidnapped, enslaved black musician, Solomon Northup, lead to Anne and her three children living at Eliza's Manhattan mansion in 1842-1843. In her last significant travels, Eliza accompanied her two adopted grandchildren on a Grand Tour of Europe in 1856, during which time a large, life-size oil portrait of the three was executed by Alcide Ercole. As symptoms of dementia took their toll on Eliza's memory and behavior, stories about her eccentricity spread through New York and Saratoga Springs. Apocryphal stories from the 1880s suggests that Eliza may have become a regular target of mockery in Saratoga Springs. Eliza remained at her Manhattan mansion for the last six years of her life, dying there at age 90 in 1865. She was buried in Manhattan at the Trinity Church Cemetery and Mausoleum. Her life (1775-1865) spanned from the first year of the American Revolution to the last year of the Civil War. A seventeen-year struggle over Eliza's estate after her death lead to the invention of discrediting stories about her character. Many of the legends surrounding Eliza's early life, including the story that Eliza had been a child prostitute with her mother in a Providence brothel, where she gave birth to an illegitimate son, as well as the story that she had murdered Stephen Jumel, first appear in questionable depositions from these trials. Eliza did embellish her own life story in old age, however, making personal reinvention difficult to distinguish from malicious fiction. Over time, Eliza's colorful exaggerations were confused with negative character stories, forming a legendary narrative of her life that has proved far more enduring and dramatic than the more prosaic reality of her life as an ambitious and highly intelligent, but also personally insecure, businesswoman. 1 2 Oppenheimer, Margaret A. (2015). The Remarkable Rise of Eliza Jumel: A Story of Marriage and Money in the New Republic. Chicago: Chicago Review Press. p. 6. ISBN 978-1613733806. 1 2 "Morris-Jumel Mansion". NYC Insider. Retrieved 2007-10-07. 1 2 3 4 "Eliza Bowen Jumel (1775-1865), socialite". National Park Service. Retrieved 2007-10-07. ↑ "History - Morris-Jumel Mansion". Morris-Jumel Mansion. Site of the historical mansion Eliza Jumel lived in from 1810 until her death, with information on visiting the house and special events. 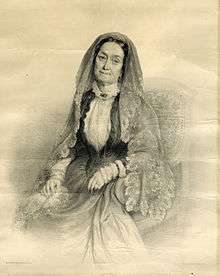 "Jumel, Eliza Bowen". Appletons' Cyclopædia of American Biography. 1892. "Eliza Bowen Jumel biography". Find-A-Grave. Retrieved 2007-10-07.